Lost in a shattered world. 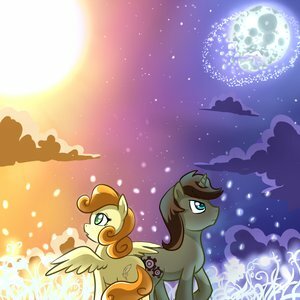 A My Little Pony: Friendship Is Magic fanfic by PK; can be found here or here . Set in the far future after Celestia and Luna mysteriously vanished and the sun and moon froze in the sky, Antipodes is the story of two ponies thrust out into the harsh new world on an adventure to uncover what happened to the world so long ago. Antipodes is now finished, and has a sequel, Lodestone , which hasn't been updated since 2014. After the End: Much of the architecture built before the disappearance of the princesses were either lost to the elements, destroyed in warfare, or inactive for extremely long periods of time. Apocalyptic Log: Judging by the opening paragraphs, Lodestone seems to be this. Audio Adaptation: The author directed one begins here . Beneath the Earth: Where those who couldn't survive on Equestria's surface went. It's also where Jigsaw and Tiptoe came from. Big Bad: Rubidium was portrayed as the absolute evil during Jigsaw and Tiptoe's time at Stalliongrad. Tantalus seems to have taken up the mantle after the former was killed. Bittersweet Ending: The Princesses are revived, Tantalus is defeated, and Equestria can begin rebuilding, but all this came at the cost of Jigsaw's life. Butch Lesbian: Incendia is a mare who is the leader of a rebellion, has been self-trained in combat, can definitely take a hit, and totally has the hots for the more feminine Tiptoe. Cool Airship: The Lunar Battleship Jigsaw finds and repairs. Defector from Decadence: Cerulean defects after Rubidium drains away most of her life for allowing Jigsaw and Tiptoe to escape. Dystopia: Stalliongrad. The city which Rubidium has come to rule for 10,000 years. Evil vs. Evil: The 10,000 year old dragon Tantalus (who has very understandable motives) versus the similarly old unicorn Rubidum (who is a power-mad tyrant). Tantalus wins this one, thanks to Rubidium's stupidity. Fallen Hero: Tantalus, aka Spike seems to be more menacing then in the main series. Having the one you love being tortured to death by a real monster to solidify his rule probably didn't do wonders for his sanity, nor is the fact that he was a victim of Demonic Possession by the force that caused the Great Cataclysm. Fate Worse than Death: Attenuation: The process by which gifted Unicorns are impaled with rods and used as a medium to convert raw power into usable power, which essentially tortures them for their entire life. Fetch Quest: After escaping Stailiongrad, The group go on a quest to acquire the fragments of Celestia and Luna. First-Person Smartass: Spectrum, protagonist and narrator of Lodestone, is shaping up to be one. Freak Out: In the ruins of Canterlot. Tiptoe, Jigsaw, and Incendia separate and encounter mysterious entities that make them doubt themselves and each other by impersonating their teammates and forcing them to relive traumatic past experiences. Though, this did not have seem to have any negative long-term effects and only strengthened their trust in each other. Gadgeteer Genius: Jigsaw, sort of. He tends to intuitively understand how machines work, and is very good at fixing them. Gaia's Lament: When Celestia and Luna disappeared the Sun and Moon froze in place; turning one side of Equestria into a barren desert that incinerates anything living, the other side becoming a frozen wasteland. Only a narrow strip of land called the Temperate zone between the two celestial bodies is capable of supporting life. Heroic Sacrifice: Jigsaw sacrifices his life in order to resurrect the Princesses. Inferred Holocaust: Jigsaw and Tiptoe discuss the fate of their city now that the water pump has been disabled. Jigsaw reasons the city should be able to fix the pump, but he's not very convinced himself. They agree to try not to think about what might happen if they can't fix it. Then, when they finally return, they discover the pump hasn't been fixed and 3/4 of the population has died to to dehydration or infighting. The farming zone has been turned into a mass grave which horrifies Jigsaw when he sees it. Lost Technology: Found scarcely, a lot of it has become inaccessible due to being located in barren wastelands where life cannot exist. Meaningful Name: Jigsaw is the mechanic, Tiptoe is the stealth expert, and Incendia is the fire specialist. Naïve Newcomer: After living underground their entire lives, Tiptoe and Jigsaw traveled to the surface where almost everything about it is completely unknown. Love Confession: Twice by Incendia. First to Tiptoe, and the to Jigsaw about her feelings for Tiptoe. Love Epiphany: Jigsaw progressively develops feeling for Tiptoe, but holds anything off until he realizes for certain that he truly is, in love with Tiptoe. Love Triangle: Between Jigsaw, Tiptoe, and Incendia. Jigsaw and Tiptoe being together, but Incendia having feelings for Tiptoe, which are also reciprocated. But because Tiptoe and Jigsaw are happily together, Incendia steps back. Surprisingly, very few of the typical romantic comedy/drama tropes appear. Magitek: Pretty much all of the technology in Antipodes are run off of magic. Out-Gambitted: Rubidium, who kills the Attenuator for Stalliongrad banking that Jigsaw will give himself up to save the city before Tantalus realizes Stalliongrad is defenseless. But Tantalus sent Jigsaw and Tiptoe to him in the first place, banking that they would lower the shield somehow, and was ready to attack at a moments notice. Playing with Fire: Incendia is the prime user of fire and fire-related abilities, such as using fire as a weapon or creating light sources. And cooking. Ragnarök Proofing: Even 10,000 years later, Canterlot Castle is still intact, along with lots of Lost Technology. Sadistic Choice: Rubidium offers Jigsaw a choice. Become the next Attenuator and save the city, or refuse and the city is destroyed. Tantalus interrupts his choice. Sealed Good in a Can: What the fragments of Celestia and Luna seem to be. Super-Powered Evil Side: Tantalus, for lack of a better term, is Spike's, though he's long since become the dominant side. Spanner in the Works: Within days of coming to Stalliongrad, Jigsaw and Tiptoe have inadvertently ended Rubidium's 10,000 year reign and caused the city to be destroyed. Time Skip: Lodestone takes place several decades after Antipodes. Voice of the Legion: Rubidium's soldier have masks that causes their voices to be deeper and intimidating. What Happened to the Mouse? : Though they're probably long dead by the time the story begins, the story doesn't say what happened to Pinkie Pie, Applejack, and Rainbow Dash during the cataclysm. World-Wrecking Wave: Rubidium unleashed the Sealed Evil in a Can Tantalus, making the Princesses and Twilight disappear and locking the Sun and Moon in place, causing the End of the World as We Know It. As two sides of Equestria become increasingly inhospitable, the country becomes engulfed in a Civil War over the last parts that will be able to support life. Writers Have No Sense of Scale: 10,000 years would be long enough for entire dialects to change, for societies to develop into distinctly new cultures, for ponies to be well on the way to developing into a distinctly new species, and for almost every piece of Lost Technology to become eroded into nothingness. Jigsaw and Tiptoe also seem to travel hundreds of miles over Equestria on foot in days, either that or Equestria is much smaller than the Earth.